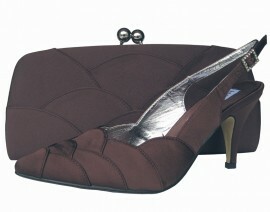 Elegant express dark brown satin clutch bag by the designer Heavenly. An elegant clutch bag with feature scalloped detailing across the front with a silver frame. 27cm x 12cm tall. The matching shoes are also available.